Purpose: Leukoplakia is the term given to a white patch or plaque that is found mainly on the oral mucus membrane. It can occasionally be seen on the corneal surface. We report our clinical and histopathological findings in a case of unilateral corneal leukoplakia. Methods: A 26-year-old woman was referred to our hospital because of a white patch on her right cornea that continued to expand. She first noticed the white patch when she was 20 years old, and the white patch had expanded to cover the pupillary area affecting her vision. 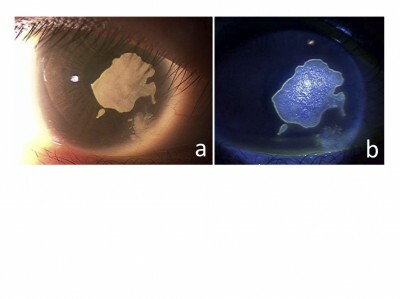 After plastic surgery on both eyelids for bilateral entropion to alleviate the pain caused by the eyelashes rubbing the cornea, the white corneal patch decreased in size. Because of this reduction, we performed surgery to remove the patch with microforceps under topical anesthesia. The plaque was removed easily and completely, and submitted for histopathological examination. Results: Histopathological examination showed that the specimen had characteristics of epidermis with a basal cell layer, spinous cell layer, granular cell layer, and horny layer with hyperkeratosis. She was diagnosed with leukoplakia of the corneal surface. The basic structure of the squamous cell layer was preserved, and there were no signs of metaplasia. Six months after the removal of the leukoplakia, no recurrence was seen and her corrected decimal visual acuity recovered to 1.0. Conclusion: Our case of unilateral corneal leukoplakia without limbal involvement was most likely caused by chronic irritation of the cornea by the eyelashes. Although it was totally removed with good recovery of vision, we continue to follow the patient because of the potential of malignant transformation.